Mr. Tej & His Team (Namely Sibi & Danshing) Of High Mountain Wave Trekking have been most helpful & provided a great inside in to what Nepal has to offer. 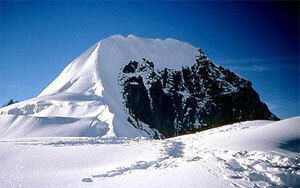 Singu Chuli peak also known as Fluted Peak is the highest amongst the "Trekking Peaks" of Nepal. This peak is situated in the Annapurna Sanctuary adjoined to Tharpu Chuli and across Hiunchuli peaks. For this peak we walk up the Modi Khola gorge to the Annapurna Sanctuary. Base camp at around 4350m and then establish two higher camps, one at 4,900m at the approach of North East Face and a higher one at 5,500m. On the North East Face of the mountain before the summit is gained. A vertical wall near the summit fronts some technical challenge on this climb. This climb is suggested to only those with some alpine and ice climbing experience. High Mountain Wave Trekking Pvt. Ltd.
We are affiliated with Nepal Tourism Board, Govt. of Nepal-Tourism Ministry, Nepal Trekking Agency Association and Nepal Mountaineering Association.